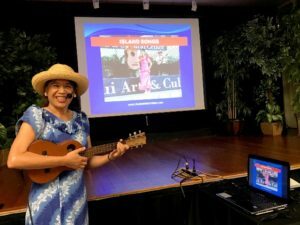 Ukulele teacher Mele Fong taught “Island Songs” for the monthly Sing-Along with Mele Fong series on August 16. “I changed my doctor’s appointment so I could come to class,” commented a participant after the program. Twenty two people signed up for my monthly Sing-Along with Mele Fong Series – Island Songs on Thursday, August 16, 2018 at Kaunoa Senior Center for adults 55 and better on Maui. During the new “Hawaiian history moment of the month” I talked about statehood. On August 21, 1959, U.S. President Dwight D. Eisenhower signed a proclamation welcoming Hawaii as the 50th state of the union and ordered a new American flag featuring 50 stars. The new flag became official on July 4, 1960. Since 1969, Hawaii has commemorated this anniversary with a state holiday on the third Friday in August which this year fell on August 17th. Read more by clicking here. The “Sing-Along with Mitch Miller” format of projecting the song lyrics and ‘ukulele chords on a screen at the front of the room, and having my husband provide the u-bass line to fill in the lower tones to the higher pitched ‘ukulele worked great! We continued the routine of learning how to pronounce any Hawaiian words in the songs, the story behind each song whether it was Hawaiian or not, and playing each song twice to reinforce what we learned. State anthem: Hawaii Ponoi – Waltz Variation Strum. King Kamehameha – I Wanna Rest/4 And Strums. Island Medley – Hum Ding-Ah/I Wanna Rest Strums. Big Island: Beauty of Mauna Kea – Latin Strum. Oahu: Honolulu I’m Coming Back Again – I Wanna Rest Strum. Oahu: Beyond the Rainbow (Waipio) – Pick in 4/Bossa Nova Strums. Kauai: Hele On To Kauai – Hum Ding-Ah Strum. Kauai: Hanalei Moon – I Wanna Rest Strum. What Aloha Means – 2 Waltz Strums. LISTEN TO THE RECORDINGS IN THE FREE ONLINE FAN CLUB and then schedule private lessons on Maui or via webcam to get the song sheets and lesson on how to play it. From the Hapa Haole Songs Category – Hanalei Moon, Island Medley, and King Kamehameha. SUBSCRIBE TO ONLINE LESSONS. Get the song sheets, video lesson, audio recording, and video story behind the song for 16 songs with unique strumming styles for beginners to intermediate ukulele players. Select the One Month Trial or the Recurring Monthly Package. Advanced Online Lessons aka Complete Monthly Online Lessons – Hawaii Aloha, Honolulu I’m Coming Back Again, and 48 other songs. PURCHASE A PACKAGED SONG SET OF BOOK/DVD/CD. Get the song sheets, video lesson, and audio recording for 6 songs with 8 unique strumming styles for beginners to advanced ukulele players. Nostalgic Hawaiian Songs Vol. 2 – Hawaii Aloha plus 5 other songs for intermediate ‘ukulele players. Stay tuned for the next Sing-Along with Mele Fong Series – Pop Hits of the 50s and 60s on Thursday, September 6.